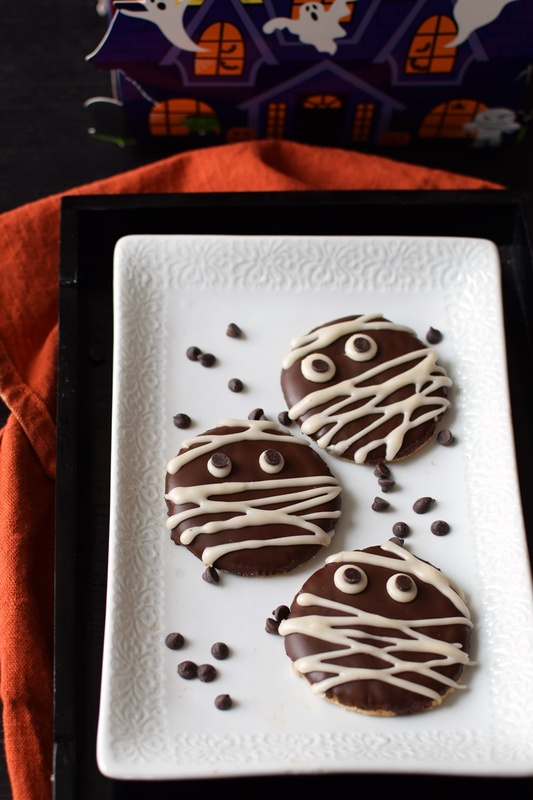 Mummy Cookies: Super-Easy Halloween Treat for All! What scares me most about Halloween? Craftiness. But these simple mummy cookies helped me overcome some creative fears without pushing outside of my comfort zone. Growing up, I witnessed my mother’s ability to hand-sew our clothes and create beautiful paintings from photographs. But her perfectionist nature eventually stopped her artistic hobbies. I inherited her stickler attitude toward details, but my father’s very analytical nature (read: zero artistic talent). So the very idea of a holiday that focuses so heavily on visual crafts is quite frightening to me. Nonetheless, I was determined to do something spooky this year, rather than playing it safe with pumpkin recipes. But you need not worry about me getting too elaborate. 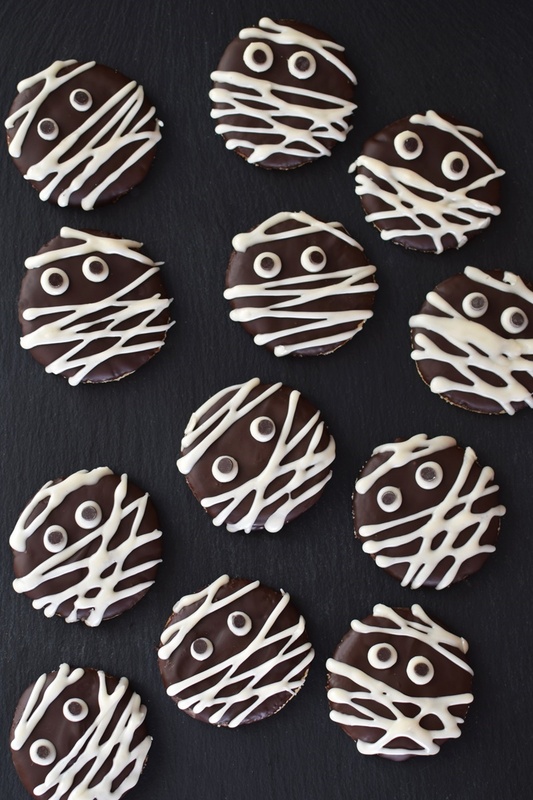 If I can make these Mummy Cookies, then I guarantee that anyone can! This post is sponsored by Enjoy Life, but the mummy cookies idea, recipe, and photos are all me. 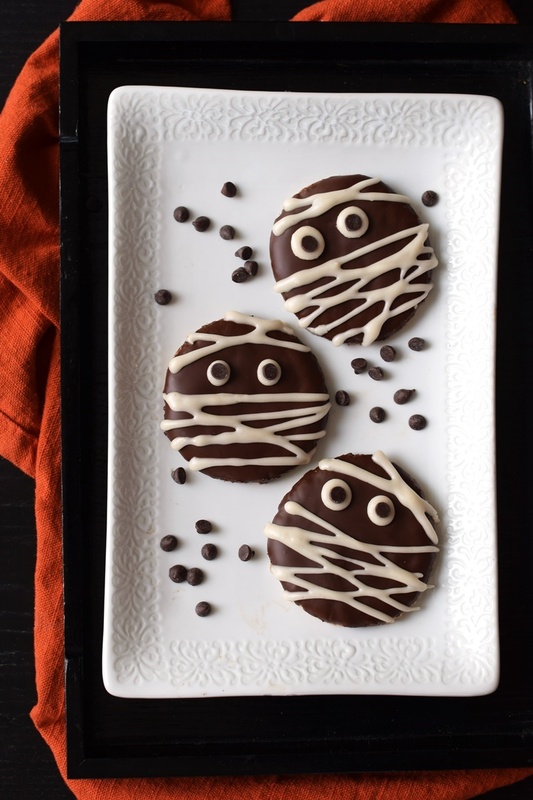 These mummy cookies are a cute, fun, and super-easy treat for parties or even making with kids. 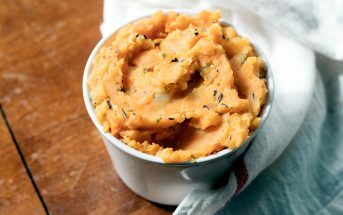 And since they use convenient ingredients, you can whip them up in less than 30 minutes. To keep them vegan, gluten-free, and free of top allergens, I use Enjoy Life crunchy cookies and chocolate chips. But if you’re like Tony and can’t keep your hands out of the chocolate chip bag (sometimes it’s hard to finish a chocolate recipe around here! 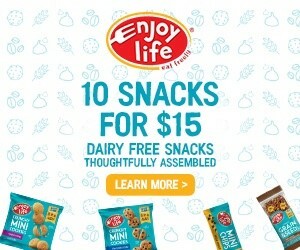 ), Enjoy Life also has new single-serve snack packs of their Mini Chips and Dark Morsels to keep you satisfied. 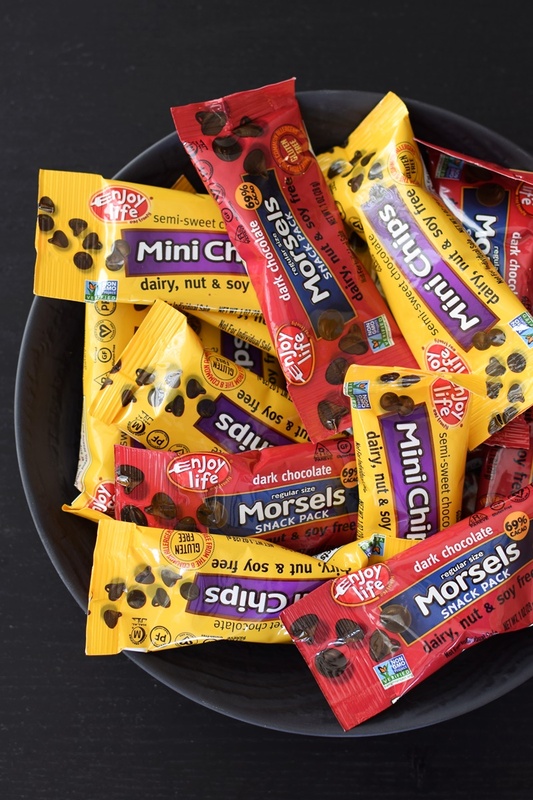 Chocolate Chip Snack Pack Giveaway – 3 Winners! This giveaway is now closed. Congratulations to Mariah, David and Sarah! 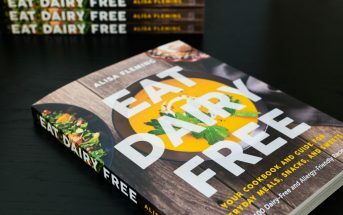 By ingredients, this recipe is dairy-free / non-dairy, egg-free, gluten-free, nut-free, peanut-free, soy-free, vegan, and vegetarian. 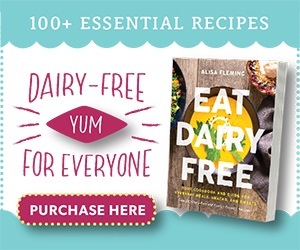 Please note that the allergy-friendly nature of this recipe is based on using Enjoy Life products, which are made in a top allergen-free facility. Melt the chocolate chips with the oil or shortening. Whisk until smooth. Dip the tops of the cookies in the chocolate (go ahead, get your hands chocolaty! ), letting excess drip off . Turn them right side up onto a wire rack or sheet lined with wax or parchment paper. Place the cookies in the refrigerator while you make the icing..
Add the powdered sugar to a mixing bowl and drizzle in the vanilla. Add the milk beverage, 1 teaspoon at a time, until you get a thick, but slightly drizzly icing. You might need just 3 teaspoons or you might need 5. I use exactly 4 teaspoons. Place the icing in something with a narrow opening for piping. 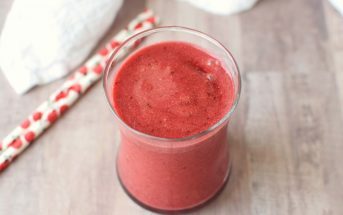 I love using squeeze bottles and bought ones like these at the grocery store. Pull the cookies from the refrigerator once the chocolate is set. Pipe two icing dots on each cookie for the eyes. Press a mini chocolate chip, upside down, in the center of each icing eye. Pipe icing across the cookies in a random fashion like mummy bandages. Store in a single layer until ready to serve. Because our place is warm, and I don't temper the chocolate, I keep them chilled. But they should keep at room temperature, too. What’s Your Favorite Homemade Dairy-free Halloween Treat? I love making spiders out of Newman’s dairy free Oreos cookies and pretzel sticks. I use frosting for the eyes. Those Oreo cookie spiders are getting so popular and are so cute! These are just too much fun. I love how festive they are ANNND that they are allergy-friendly too!! (That almost never happens!) I will definitely be making these for October 31st!! Yes, those rice krispy treats are definitely a childhood classic. 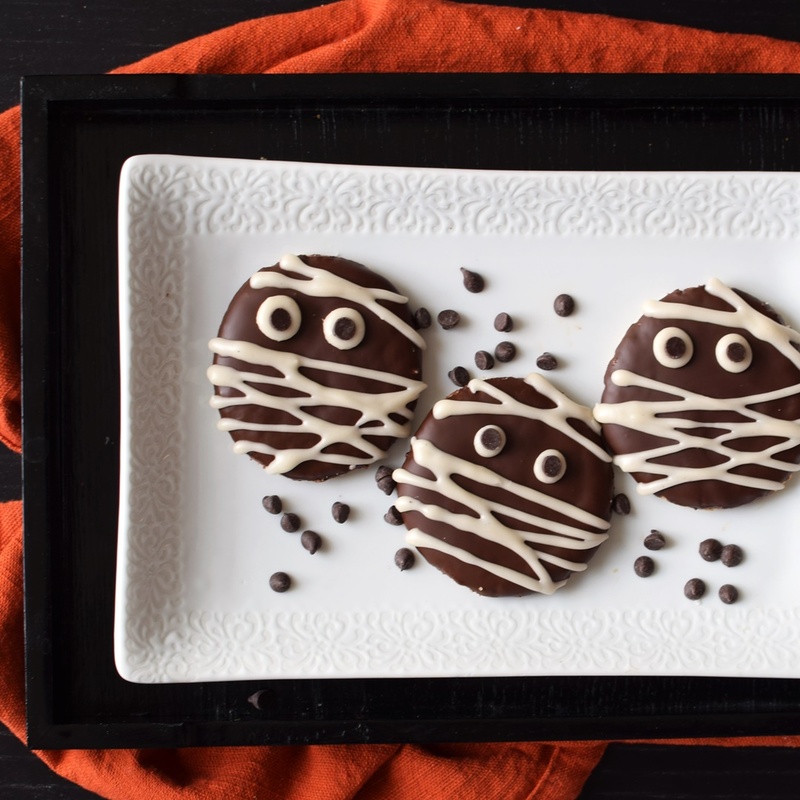 We love pumpkin cake and Oreo eyeballs! Oreo eyeballs?! I’m going to have to look that one up! How completely adorable!!! I love that there are allergy friendly options for the kiddos these days. So much safer! Thanks Julie! Yes, a definite treat, but “safe” for most! I’m a sucker for Reese’s! 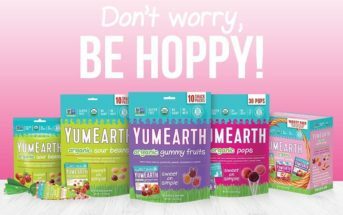 Enjoy Life Foods is my favorite brand of allergy-friendly chocolate!! We just moved into a neighborhood that is ALL ABOUT the Halloween celebrations. I’ve been thinking of something to bring to the festivities and these would be perfect! That’s so cool! I’ve always wondered what it would be like to live in one of “those” neighborhoods. It must be amazing for kids. These are so adorable. And every time I see them I want to shove a handful in my mouth!! 🙂 My fave dairy free homemade Halloween treat is brownies. I don’t know why, but I always associate rich chocolatey brownies with Halloween. Boo! We usually just do vegan cut-out cookies, but I don’t know – these could be my new favorite! “just” cut-out cookies. That’s tasty fun in my book! All vegan, of course ? Um, wow! Now I want to see the recipe for that, it sounds amazing. I like to make home made chocolate peanut butter cups. Vegan Caramel Apples are a favorite in our house. Great idea! I need to make some this year. Thanks Shirley, that’s awesome! Do you have those Power Balls up on your site? They sound familiar, but I don’t know if I’m remembering incorrectly. If you do, feel free to share the link here as I’m sure others would love to see those! my kids love to make orange tinted rice krispie treats in the shape of pumpkins! OOHH, we will definitely have to try these in our house. So cute and we love allergy-friendly ideas like this! My favorite dairy free Halloween treat would have to be buckeyes. I’m from Ohio and they’re a must have around here. I LOVE dairy-free buckeyes. So easy and so, so good.